If you’re a longtime follower of the blog, you can probably look at the photo above and guess that Chareva and I are starting another spring project. You’d be right. 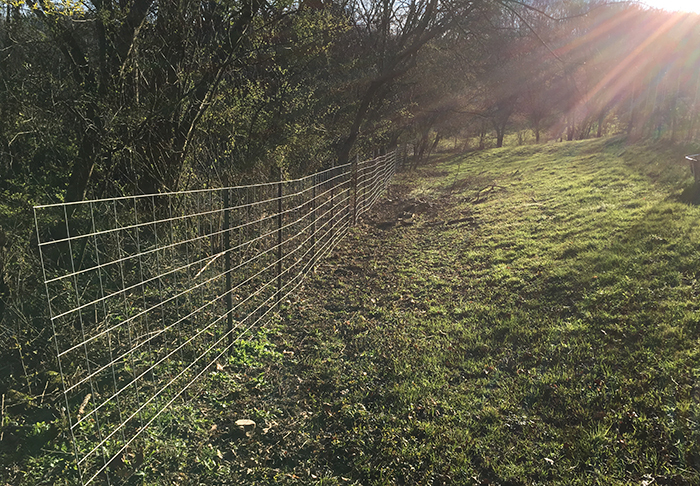 I found this a bit surprising because we already have a spring project: fencing in the entire back of the property to give the dogs a big ol’ space to explore. 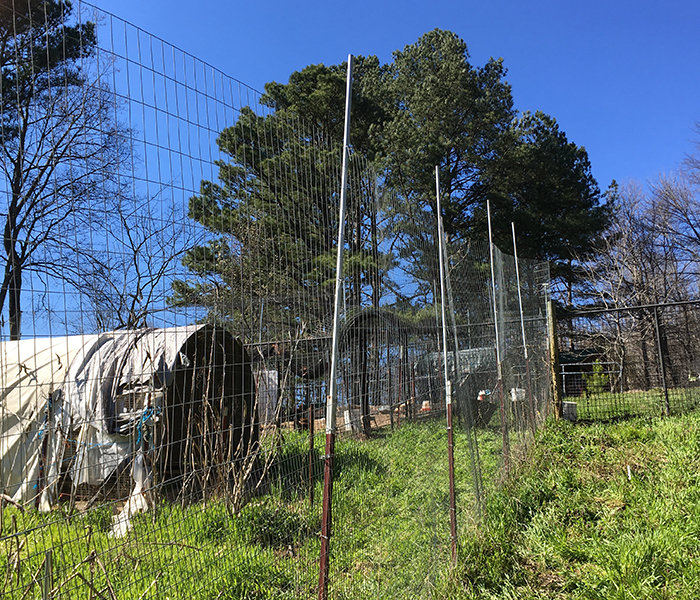 But as you can see from the photos of the rooster and two of our punk-rocker hens, the current chicken yard isn’t exactly a grassy paradise anymore. They need fresh ground. 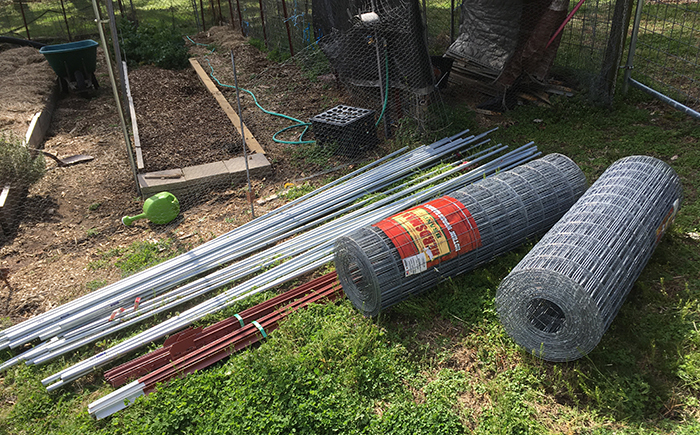 They also need not to get killed when we move them to fresh ground, which means getting the old chicken yards up to snuff. So we added a spring project to our spring project. Let me back up and report on the progress of Spring Project #1 first. Some weeks ago, we took a break from that project to give the dogs a bigger yard. Actually, we gave them a bigger yard again. When this ginormous tree fell, it destroyed the fence that penned in the side yard. 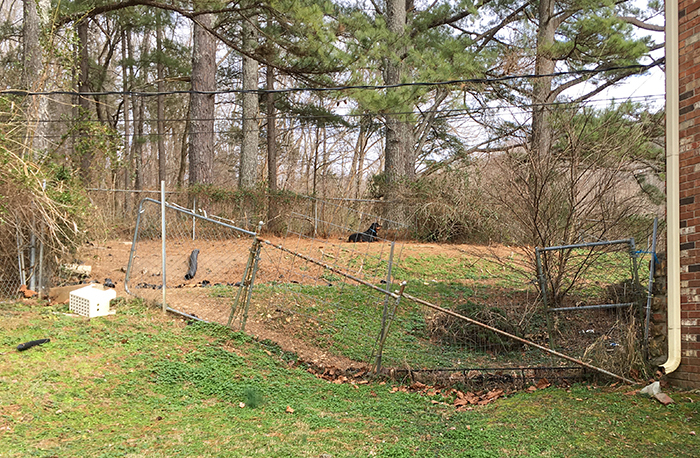 To keep the dogs out of the now-open side yard, we quickly threw up a barrier that looked like it was designed by Jethro Clampett. It was a (ahem) “temporary” fix that’s been in place for months. 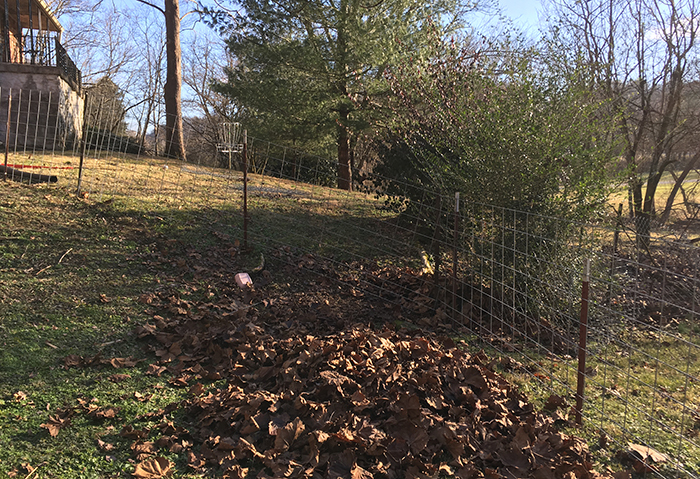 Now that we’re flush with t-posts and cattle panels and other fine fencing materials, we decided to spend a day constructing a fence that pens in most of the side yard again, minus the section covered by the ginormous tree. (Cutting that tree into firewood will be yet another project later this year.) The dogs now have a bigger area to roam while we prepare a huge area to roam. 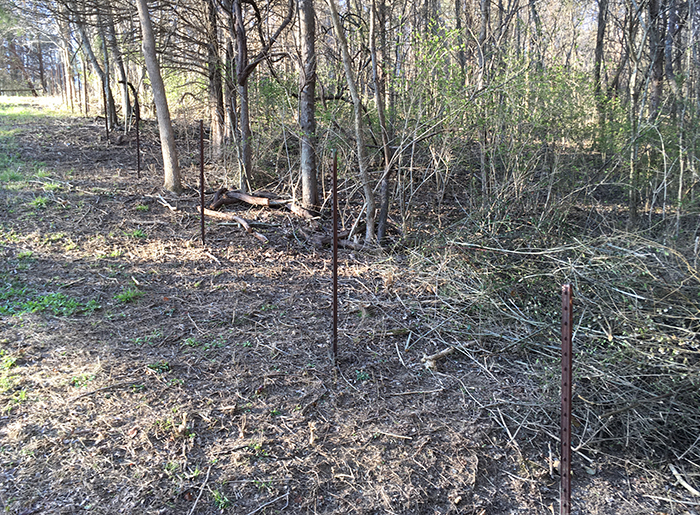 With that mini-project out of the way, we returned to fencing in the back of the property. 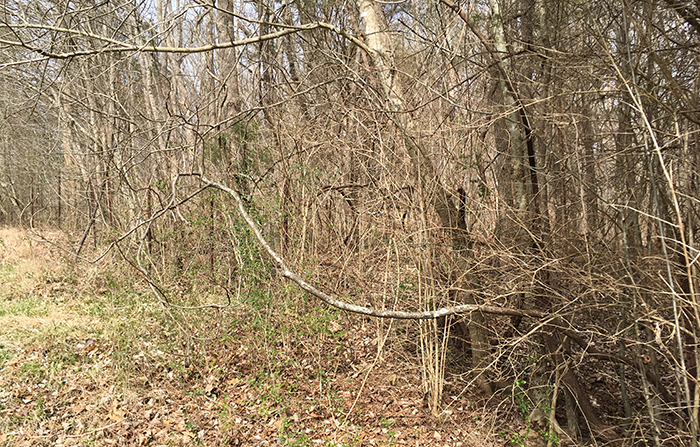 As I’ve mentioned, there’s a line of t-posts running along much of our property line, but the jungle had grown up and around it. 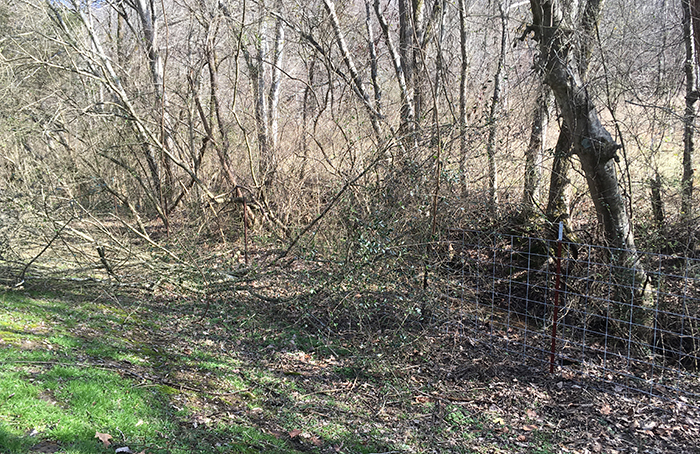 So the first task for me was getting out the chainsaw and hacking down spindly trees and not-so-spindly vines clinging to them. Then I cut the trees into firewood. The logs will need to sit in the barn until next winter, of course. In the picture above, Chareva is standing pretty much at the corner of the property. Over the next weekend, we managed to put up cattle panels all the way to that corner. The shot below is from the corner, looking back towards the creek where this project started. 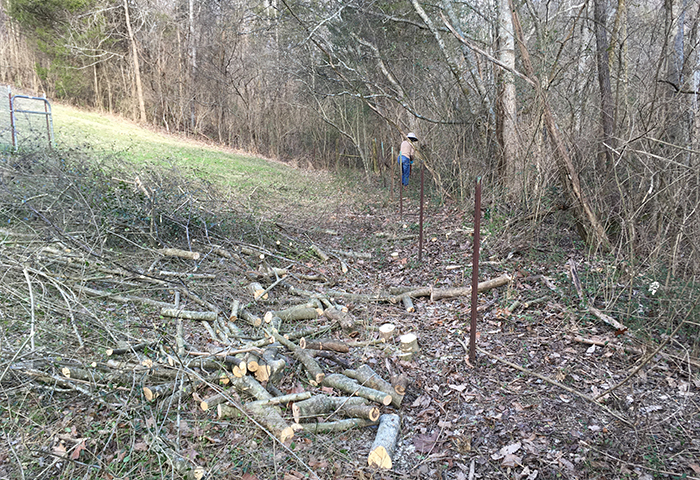 The next section of the fence will run along the property behind the house. If you squint, you might see the line of t-posts that have been sitting there since we bought the place. Or you might not, thanks to the spindly trees and vines. Clearing the area around the t-posts required a combination of the chainsaw and The Beast. That’s as far as we got before Chareva reminded me the chickens need fresh ground. So we set aside Spring Project #1 for Spring Project #2. Because it was the third chicken yard we built, we finally got it right. No critter has ever gotten inside. But security aside, it’s just a much more pleasant space. 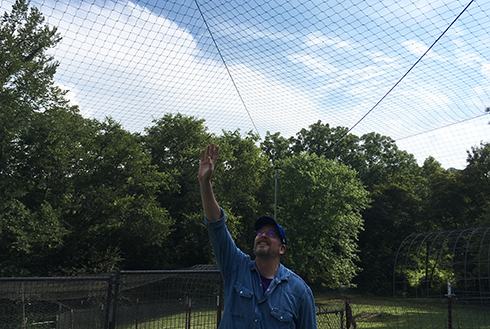 In the old chicken yards, despite my efforts to raise the nets, I had to stoop over. Trust me, it’s no fun trying to manhandle a bucking tiller while half-crouched. 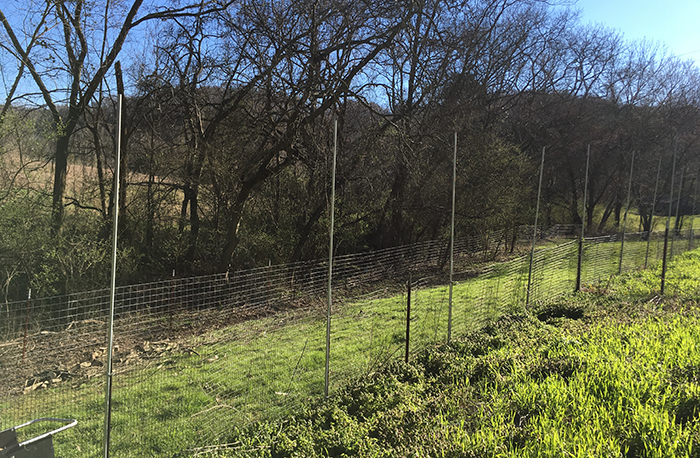 When we built the newest yard, it finally occurred to us to stack one fence on top of another, string paracord across the whole yard, and raise the nets nice and high. We’ve also gotten smarter about our building techniques. 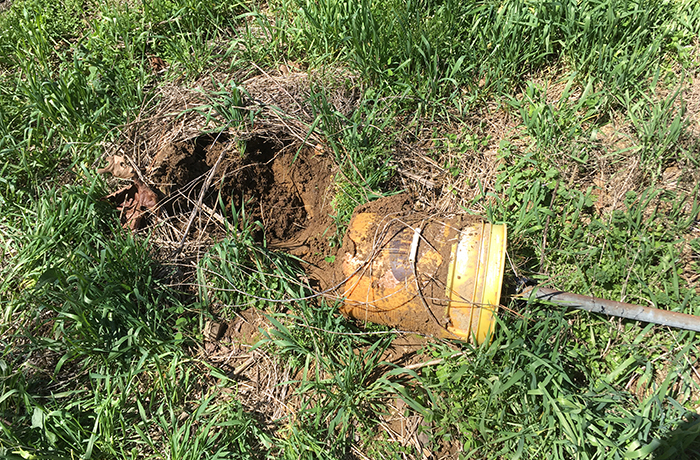 Back when we built the first two chicken yards, I thought I’d figured out a great solution for raising poles: stick the pole in a bucket of concrete, let the concrete dry, then dig a hole and bury the bucket. Brilliant! Later it occurred to one of us (probably Chareva) that we could simply pound a t-post into the ground, then strap the pole to the t-post with plumber straps. We don’t lose a foot of the pole’s height underground, and it’s easy to move … just pull up the t-post. So the start of Spring Project #2 for me was digging up the old poles. 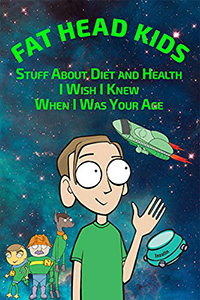 I may have uttered a few ancient curses known only to small-time farmers, but I don’t remember. To tighten plumber straps to t-posts during our previous projects, I originally used a screwdriver. I did that more times than I’d like to admit. At some point last year, it occurred to me that a 5/16” socket fits nicely over the nut that tightens the strap. (In my defense, that stupid nut also has a slot for a flat-head screwdriver. Coulda fooled anyone.) So I began using a socket wrench, which was somewhat more efficient. For this project, it finally occurred to me that I should be using a cordless drill. Okay, it occurred me to after Chareva mentioned I should be using a cordless drill and called her brother Alex to ask which kind of cordless drill to buy. I bought the one he told her to buy. Alex is young enough to be my son, but he’s already spent more time using tools than I’ll spend in my lifetime. Ahhhhh, the joy of using the right tool for the job. Tightening a plumber strap with a socket wrench goes something like this: crank-crank-crank-crank-crank-crank-crank-crank-crank-crank-crank-crank-crank-crank-crank-crank-crank-crank-crank-crank-crank-crank-crank-crank-crank-crank-crank-crank-crank-crank-crank-crank-crank-crank-crank-crank-crank-crank-crank-crank-crank-crank-crank-crank-crank-crank-crank-crank-crank-crank-crank-crank-crank-crank-crank-crank-crank-crank-crank-crank-crank-crank-crank-crank-crank-crank-crank-crank-crank-crank-crank-crank-crank-crank-crank-crank-crank. With the cordless drill, tightening a plumber strap goes something like this: zzziiip. Thanks to zzziip, we got all the poles for the outer perimeter up in no time. The next job was adding that second level of fencing. I couldn’t remember exactly how we went about it in 2017, so I decided to just re-engineer the whole process. I suggested a couple of plans requiring ropes, scaffolding, pulleys, winches and a diesel-powered engine. 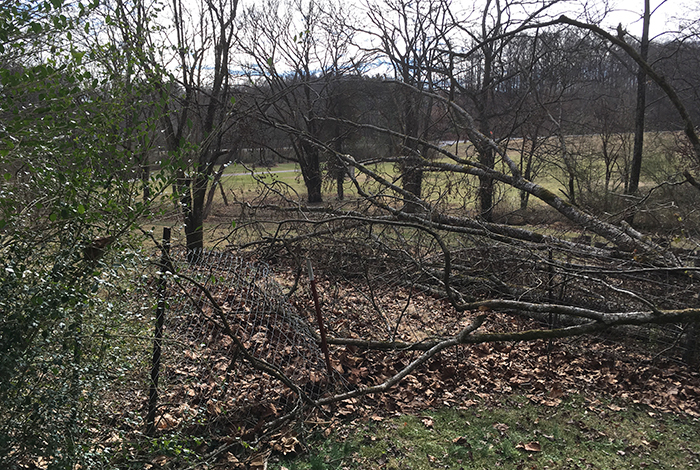 In my head, I did several calculations involving the weight and length of the fence, the strength of the clips, the current wind velocity, etc., and explained to her why trying to flip up a long, wobbly fence almost certainly wouldn’t work. We’d need at least a six-person crew to hold the thing in place and keep it from flipping back down. She said she wanted to try anyway, and because I’m a good husband, I decided to indulge her. So after she finished clipping the fences together, we flipped the new fence up and into position. 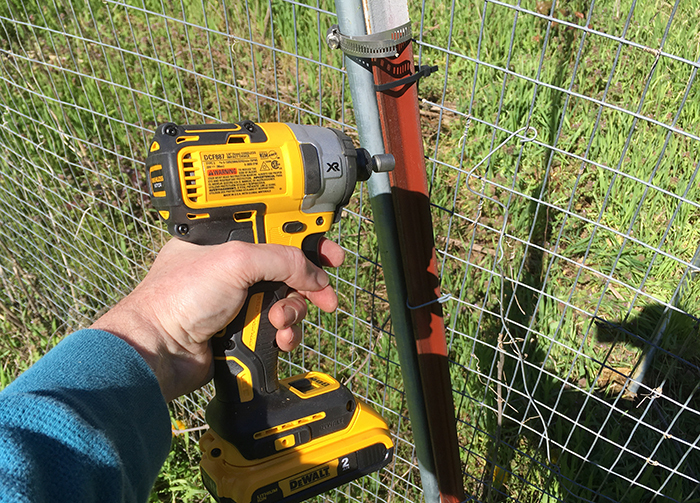 I prepared myself for the sound of those little clips snapping apart and the sight of the new fence falling down and rolling itself up. In my defense, one of the clips did snap. Really, it did. On that section of fence, anyway. When she clipped together the next 45-foot section of fence and we flipped it up into position, nothing snapped. After each section was flipped up, Chareva secured it to the poles with aluminum ties. My job was to hold the ladder. And not say anything. And we still have a project and a half to go. Wait – so now you know how to use sockets?!? 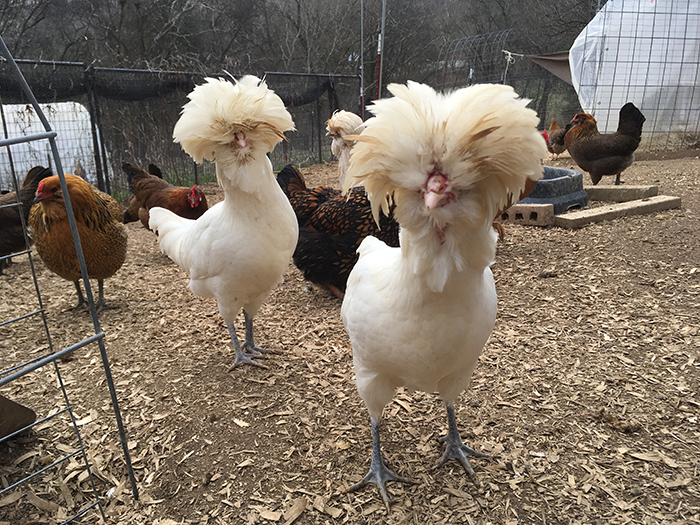 My office-mate and I have to know: how do those punk rocker chickens see? I’ve asked, but they refuse to divulge. 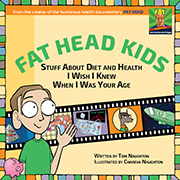 Are they related to Ted Naiman’s cat at all? Wow — all this should be giving you a king-sized sense of accomplishment. But I had to chuckle at the fence clip story. Reminded me of the night my husband and I struggled home through a freezing rain and found that our car would not go up our sloping driveway. I suggested sprinkling some kitty litter on the pertinent section of the drive, and my husband said “That won’t work.” He got a snow shovel and tried to clear the drive, but that made no impression on the hard ice. I suggested kitty litter again. He said that wouldn’t work, and tried breaking up the ice with the tip of a garden shovel and then with a tire iron, as I recall. The car still couldn’t get traction. Finally, I went into the house, grabbed the bag of cat litter, and sprinkled a little on the driveway. Just to show me how foolish I was being, George stepped on the gas — and zipped up the drive and into the carport. It took him a while to forgive me. Heh-heh … that’s why men need wives, to keep us humble. 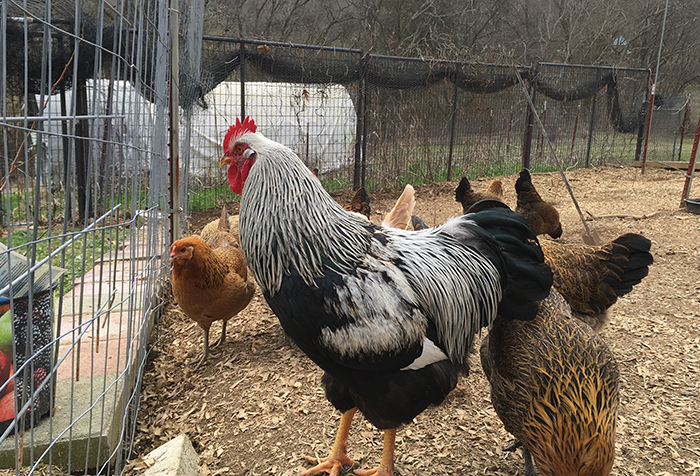 I’m always amazed at all the effort and money you have to invest just to keep a few hens. We’re certainly not making a profit on the eggs we sell. It’s a lifestyle thing. Your job is to make money programming them there compootahs, then pay some grizzled old hillbilly to make proper wooden fences. But we look forward to the outdoor labor … I think.